RP41587PN is rated 2.5 out of 5 by 2. Rated 1 out of 5 by nickname1 from absolute garbage. the throw looks terrible when the drain is closed....sticks 5+ inches out above the sink line and twists in all directions. 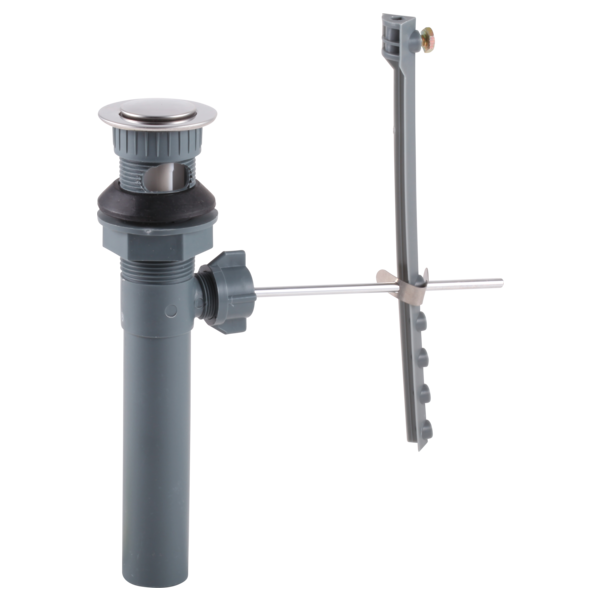 the drain stop is controlled by a metal rod connected to a cheap plastic extender that buckles under very little pressure. I would like to replace the existing brass drain pipe with this plastic version, will I still be able to use the flange from my old assembly? Manual does on say how tight to tighten plastic nut against gasket on bottom of sink. Is it just hand tightened or do you use a wrench to tighten a bit more to get proper water seal on under side of sink? Thanks. Thank you for your question. When tightening nut when using Delta Faucet part # RP41587SS, hand tightening will give you the proper water seal. Is the nut shown in the plastic pop-up (in the PDF, not this screen..it looks different) sold separately? The one in the lower pic is not the same. Thank you for your question. Delta Faucet model # RP41587 does not come as separate parts. If you need the nut from it, the whole pop-up assembly will need to be replaced. Do I have to remove the entire sink to use this matching pop-up set in order enough entry into trap collar? Can this be used with a sink that has NO overflow? Do you have installation instructions? Especially whether I can use plumber's putty. I bought this kit but there were no instructions.